VERACRUZ, Mexico -- Franklin has become the first Atlantic hurricane of the season as it moves toward Mexico's Gulf coast. The National Hurricane Center in Miami upgraded the storm to a hurricane late Wednesday afternoon. Franklin has maximum sustained winds of 75 mph (121 kph). The storm is about 105 miles (169 kilometers) northeast of Veracruz, Mexico, and moving west at 12 mph (19 kph). A hurricane warning is in effect for the coast of Mexico from Puerto de Veracruz to Cabo Rojo, and a hurricane watch extends north of Cabo Rojo to Rio Panuco. 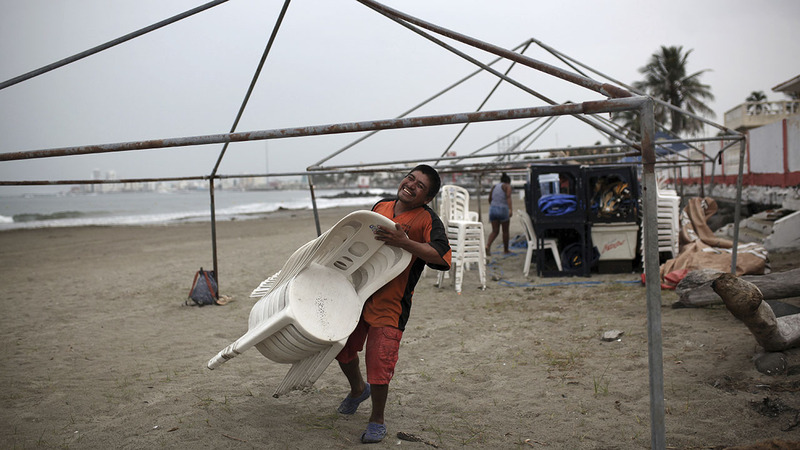 Forecasters expect the hurricane to continue strengthening until it makes landfall in the state of Veracruz late Wednesday or early Thursday. The hurricane center says storm surge will raise water levels by as much as 4 to 6 feet (1.2 to 1.8 meters) above normal tide levels along the coast. Forecasters say rainfall of 4 to 8 inches (10 to 20 centimeters) is possible, with some areas getting as much as 15 inches (38 centimeters) of rain.